Why, at the detours of the middle-aged streets of the picturesque district of Petite-France, do not you let yourself be tempted by a warm welcome, a warm atmosphere, and a delicately refined cuisine? It is indeed at the intersection of the rue des Dentelles and rue Escarpée, that the team of the restaurant "L'Eveil des Sens" will make you discover the pleasure of a cuisine combining tradition and originality. It is with pleasure and know how, that the whole team is working to cultivate the so typical atmosphere, specific to the district of the Petite-France, and to amaze you by making you profit from a kitchen as fine as developed. Our chef Antoine Huart and his second Pierre put all their experience at the service of "good eating". In the dining room Marie and Dominique, welcome you in a great conviviality and will put all their knowledge of "good drink" at your service. 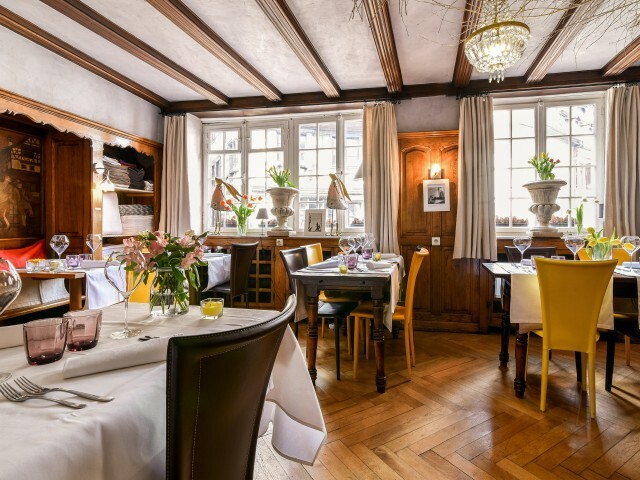 It is in an elegant setting, tastefully decorated and respecting the high Alsatian tradition, that you can take a seat, and enjoy frescoes and period architecture. The warm atmosphere of the woodwork of the first floor room will add an intimate touch or family to your meals, and can also accommodate banquets of twenty people. The conviviality is master word in the room of the ground floor, decorated with frescoes representing characters of time.